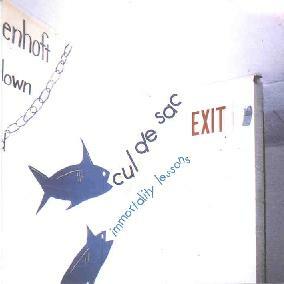 Cul de Sac - "Immortality Lessons"
Cul de Sac's latest is a live offering from a performance done in 1999, recorded for a real time broadcast at Brandeis University's campus radio station WBRS. What the band initially thought was an awful performance turned out, when listened to later, to be nothing short of brilliant. Somehow, in the dead silence of a university campus abandoned for summer, with a lack of sound checks, conflicts and emotions running high amongst band members, Cul de Sac managed to create not only a solid, but a stand out, performance. The Boston, Massachusetts's quartet's sound draws influence from krautrock, surf rock, and folk music, blending them together into a unique mixture of sonic weirdness. And while several of the tracks on Immortality Lessons are re-workings of material from their previous studio album (such as the playfully re-titled tracks Etaion Without Shrdlu and Frozen in Fury on the Roof of the World), much of the album represents new material. And amongst a few solo compositions like electronics player Robin Amos's deeply choral keyboard piece Liturgy, drummer Jon Proudman's surprisingly restrained Enhoft Down, and bassist Michael Bloom's thumper Tartarugus, the band offers up a couple of amazing 10+ minute creations. The Dragonfly's Bright Eye ventures into serious krautrock territory, and just may get you thinking you've discovered a lost Ash Ra Tempel album, while the album closer, Blues in E, is a relaxed and spacey trip with lovely guitar work from Glenn Jones. The title track is of particular interest to fans of the band. It was actually one of the pieces originally written for their aborted collaboration with John Fahey (the band did actually end up recording an album with Fahey, but it was not the album originally intended). Immortality Lessons is a great, upbeat rocker that sounds like something that could have come out of the China Gate sessions. The DJ who engineered the show, Ofer Inbar, does a terrific job of capturing all the subtle dynamics of the band's performance, making this a must have for fans of Cul de Sac, and a great place to start if just discovering the band. Immortality Lessons is distributed by Strange Attractors. You can visit their web site at: http://www.strange-attractors.com.